Sir Malcolm Campbell uses Dunlop tyres. Homepage. This page: A hero of both land and water speed record attempts gives his recommendation for Dunlop motor-car tyres. 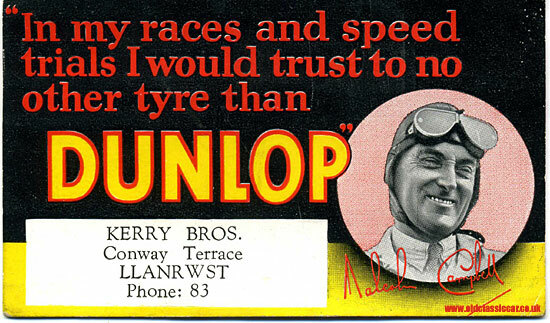 Malcolm Campbell, later Sir Malcolm Campbell, is seen on this vintage blotter advocating the use of Dunlop tyres, based on his experiences of speed-record attempts using their covers. He says: "In my races and speed trials I would trust to no other tyre than Dunlop". These advertising giveaways would have been distributed to stockists of Dunlop tyres across the country, each personalised with that particular stockist's details. This example was destined for Kerry Bros, of Conway Terrace, Llanwrst, a small town nestled in the Conwy Valley alongside the banks of the River Conwy in North Wales. Unsurprisingly there's no business of that name existing in Llanwrst now, although Conwy Terrace is still listed. The closest match I can find in the RAC Handbook (1959 issue) is for Jones Bros, of Kerry Garage. Is this the same company? A copy of the Handbook for 1928/1929 mentions Jones & Wight, of Central Garage, but nothing else, although of course Kerry Bros could have been there, but not running with RAC accreditation. Sir Malcolm Campbell was born in 1885, and gained fame thanks to his numerous speed record attempts, on both land and water, in a variety of machines. The first vehicles were called Blue Bird, later simplified to Bluebird. An account of Malcolm Campbell's 1927 Blue Bird is recalled in a contemporary issue of The Nelson Lee Library. His taste for speed began in 1906 when he started competing in town-to-town motorcycle races, before switching to four-wheeled automobile races at Brooklands in 1910. Following WW1 he continued his high-speed exploits, capturing the land speed record in 1924 on Pendine Sands in South Wales, the first of nine speed records he'd claim over the following eleven years. On the 3rd September 1935 he'd crack the 300mph mark in his Bluebird at the Bonneville Salt Flats in Utah, USA. He was knighted in 1931, suggesting that the blotter above, which makes no mention of a title, pre-dates that occasion. More items of paperwork relating to motoring in the pre- and post-war years, including several blotters, can be found in the Motoring Collectables section. Many motoring books of the 1920s and 1930s featured Sir Malcolm Campbell and Bluebird on their covers, some of these can be seen in the pages of the children's car book covers section. Another blotter featured here in the Collectables section also hails from the Dunlop marketing department.